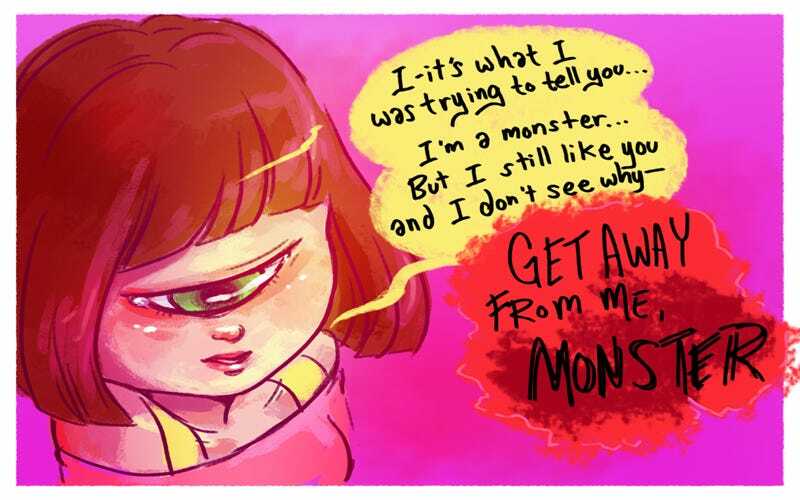 George is a sweet and naive cyclops girl who is occasionally subject to anti-monster racism. But when she and her friends enroll in an integrated human-monster university, even the monsters will encounter new types of people who could broaden their horizons. Maya Kern's webcomic Monster Pop! opens with best friends George and Franny, a witch, on a scene at a human party that highlights the prejudice that exists within their world. Monsters make up a sizable percentage of the population and live fairly normal lives. But some segregation still exists, with human-only high schools and even cities that are almost entirely inhabited by either monsters or humans. But the real story begins when George and Franny enroll in Unity University, a school that educates humans and monsters side-by-side. In many ways, Monster Pop! reads like a very familiar beginning-of-college story, with our protagonists meeting new people and learning about their interests and backgrounds while trying to settle into college life. But Kern is the creator of Redden (featured previously), a wonderfully weird reinterpretation of Little Red Riding Hood, and she knows how to defy genre expectations. While George and Franny may be concerned about how humans view them, there are other students who are feeling deep insecurities of their own. George befriends Marina, a gorgon girl who is just learning how to manage her more dangerous qualities among humans. And Franny finds herself drawn to Percy, a boy from a human city who is carrying some secrets that may surprise even Franny—a girl who is used to demanding acceptance from others. Much like Ava's Demon, Monster Pop! is very much formatted for the Internet, with a rhythm that is well suited to the click of the "next" arrow. And since the characters in the comic utilize modern texting and social media, Kern has set up Tumblr blogs for some of her core characters, which enable George and Franny in particular to interact with the comic's readership and offer some insight into Marina and Percy's interests.